Every writer I know has at least one novel tucked away in his or her hard drive collecting digital dust. These novels will probably never get published. Writing a novel good enough to get published is even harder. Even if you do write a novel good enough to be published, getting noticed by agents and publishers is nearly impossible. And by the way, if you decide to self-publish, your odds of being the next Amanda Hocking or John Locke are too low to mention. However, there’s another option: Short Stories. Short stories have traditionally been the training grounds for writers learning the craft. Writers like Stephen King, Ernest Hemingway, and even Mark Twain didn’t start out writing novels. They learned the art of fiction by writing short stories. Short stories can make your career. Maybe it’s time to stop slaving away at novels and learn how to write and publish short stories. Let’s Write a Short Story! is an eBook about the process of writing and publishing short stories. The book will guide you through the process of researching publications, writing your story, editing, and submitting your work to literary magazines. It’s also a primer in how to make a career in fiction writing. If you’ve ever wanted to be a writer, this book will help get you started. Let’s Write a Short Story! won’t just give you the information you need. It will challenge you to take the next step in becoming a writer and help you get your writing published. Let’s Write a Short Story Today! Are you ready to take your writing career seriously? Is it time to stop fantasizing about one day getting published and to start working towards it? If you’re ready to stop making excuses and become a real writer, then let’s write a short story! 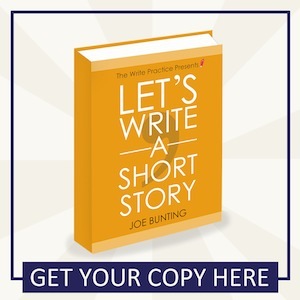 To start becoming a real writer, get the eBook Let’s Write a Short Story! Take your writing career seriously. Get your work published. And become a better writer today.